NOTE: The FSU, together with the Mass Socierty of Professors at UMass Amherst, form a single bargaining unit that is operated by a governing body called the Joint Coordinating Committee. To see the JCC bylaws, click here. To see a list of FSU policies that are not included in the FSU bylaws see here. 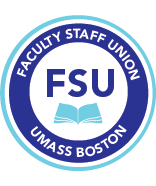 The Faculty Staff Union, Inc. (FSU) of the University of Massachusetts at Boston is formed for the benefit of the teaching faculty and librarians at the institution. It is committed to maintaining an atmosphere in which teaching, research and service to the public can be carried forward at high levels of excellence. The members of the FSU believe that these goals can be promoted and protected by contractual agreements reached through the collective bargaining process. Reaching those agreements and monitoring their operation is one of the chief duties of the Union leadership on the campus. The contractual process likewise provides a forum for the resolution of differences concerning salary, working conditions, professional standards, the relationship between faculty/librarians and University administration, and such other matters as fall within its purview. The Faculty Staff Union, Inc. is also dedicated to safeguarding the integrity of academic freedom as expressed in the 1940 Statement of Principles of the American Association of University Professors. The Faculty Staff Union, Inc. believes that a university ought actively to seek a diversity of views and opinions and promote professional equity. To this end it supports the principle of Affirmative Action. The Faculty Staff Union, Inc. is created for these purposes and to engage in any other related activities that are consistent with the law. Section 1: The Faculty Staff Union, Inc. shall consist of all bargaining unit members within a bargaining unit affiliated with the Faculty Staff Union. Section 2: Membership in the Faculty Staff Union, Inc. is open to any member of any bargaining unit (as defined in the applicable collective bargaining agreement) represented by the FSU at the University of Massachusetts at Boston. To be a member in good standing, all dues and assessments must be paid in full. Only such members may vote in elections conducted by a chapter of the Union for the purposes of developing policy and/or electing officers. Section 3: A member of the Faculty Staff Union, Inc. must also be a member of the Massachusetts Teachers Association and the National Education Association. All members are entitled to all the benefits and services provided by these organizations. Section 4: The Faculty Staff Union, Inc. is affiliated with the Massachusetts Society of Professors in a unit-wide local called MSP/FSU in accordance with the current bylaws of the Joint Coordinating Committee with representation from the Amherst and Boston campuses of the University. Section 1: There will be officers for the chapter, each of whom shall be a member in good standing of the chapter. Candidates for President and Vice President of the chapter shall be self-nominated from among members of the chapter. Section 2: The President and Vice President of the chapter shall be elected at large by the membership of the Faculty Staff Union, Inc. The election shall be by secret ballot during the spring semester. To be elected to either of these offices, a candidate must receive a simple majority of the votes cast. In the event that no candidate receives such a majority, there shall be a run-off election between the two candidates for whom the largest number of votes were cast. The new officers will take office at the end of the spring semester. Section 3: The President and Vice President of the chapters shall serve for a period of two years. In order to provide for continuity in leadership, the terms of the two principal officers will be staggered. a. Presiding at meetings of the chapter's Executive Committee and preparing the agenda for these meetings. b. Presiding at the General Assembly and preparing the agenda. c. Serving as the Union's liaison to the campus administration and governance structure through the Faculty Council, whose meetings he or she attends. d. In alternate years or semesters, serving as President, Vice-President, or any other leadership positions of the Joint Coordinating Committee, which coordinates Union activities between the Amherst and Boston campuses..
e. Chairing the Annual Meeting of the General Assembly and any other meetings of the General Assembly. f. Supervising the operations of the FSU office and its staff. g. Establishing and filling, with the consent of the Executive Committee, special committees that are responsible for a specific activity. h. Liaisoning with representatives of the Massachusetts Teachers Association, including attending meetings of said organization. i. Responding to the needs of the membership and to act accordingly. j. Communicating with the membership.. Section 5: Through a provision in the collective bargaining agreement, the President of the Boston Campus Chapter is entitled to a teaching load reduction of one course per semester. Should the President be a librarian, he or she is entitled, by the same contractual provision, to receive a workload reduction equal to one and one-half days per week. The President of the Boston Campus Chapter is also entitled to receive a stipend from Union funds during his or her term of office. Section 6: The President of the chapter is empowered to act on behalf of the membership in all matters pertaining to the collective bargaining agreement. He or she will consult frequently with members of the chapter's Executive Committee and should discuss anticipated policy decisions at regular meetings of the committee. Section 7: The Vice President of the chapter may be delegated by the President to perform any executive function. In the absence of the President, the Vice President is empowered to discharge the functions of the President for the chapter. Section 8: The Clerk of the chapter will be elected by the Executive Committee from among its members. The term of office is one year. a) The Clerk shall keep the official records of the organization, including minutes of the Executive Committee and General Assembly meetings, and shall be responsible for timely notification to the membership of all regular and special meetings. Section 9: The Treasurer of the chapter will be elected by the Executive Committee from among its members. Should no member be willing to serve, the Executive Committee shall elect someone from among members of the chapter, who will be a non-voting member of the Executive Committee. The term of office is one year. a) The Treasurer shall work with the accountant to ensure the accuracy of the financial reports, keep the executive committee informed of the chapter’s financial status, and present the proposed budget to the Executive Committee and to the annual meeting. Section 1: The Executive Committee of the chapter shall be responsible for directing the operation of the chapter and for implementing its policies. Section 2: The Executive Committee of the Boston Campus Chapter shall consist of 13 members. The President and Vice President of the chapter are ex-officio members of the Committee. The remaining 11 members shall be elected by and from their respective constituencies. The constituencies to be represented according to their proportionate numbers within the bargaining unit are: tenured faculty, non-tenured tenure track faculty, non-tenure track faculty, and librarians. A member of the Executive Committee, preferably who teaches or has taught in CAPS, will be selected to represent CAPS. Each constituency in the bargaining unit shall have at least one representative. The Executive Committee shall periodically review the allocation of representatives for each constituency and make recommendations to the General Assembly. The President and the Vice President shall be counted in this proportional breakdown. Section 3: Candidates for officers and membership on the Executive Committee of the chapter shall be self-nominated in accordance with FSU election procedures. Elections shall be conducted by secret ballot, and seats on the Executive Committee shall be filled by those candidates receiving the highest number of votes. Section 4: The term of office for members of the Executive Committee of the chapters shall be two years. Elections to fill vacant seats on the Committee shall be held annually during the course of the spring semester. New members take office at the end of the spring semester. Section 5: Should a seat on the Executive Committee become vacant through resignation, the Committee shall, at its sole discretion, either (1) choose a replacement from among those who were candidates in the previous election, (2) allow the seat to remain empty until the next general election, or (3) allow the membership to elect a candidate to serve the remainder of the term. Such an election will be a special election called by the Executive Committee, or will occur at the next regularly scheduled annual election. Section 6: Meetings of the Executive Committee shall be open to all members of the chapter, and any member may address the Committee upon written petition (at least five business days prior to the meeting including what will be asked of the Executive Committee) to the President of the chapter. In order to assure confidentiality, all discussions of matters pertaining to collective bargaining or grievances shall be conducted in executive session. Section 7: A quorum for the purpose of conducting business shall consist of a simple majority of the Executive Committee of the chapter. A member of the Executive Committee who misses three meetings in the course of a semester may be removed by majority vote of the Executive Committee. Section 8: The Executive Committee shall have the power to employ a staff for the efficient management of the chapter, and shall pay for this staff from its own budget. It shall establish personnel policies for this staff. Section 1: An elected officer or any member of the Executive Committee of the chapter may be recalled for malfeasance before his or her term of office expires. A petition for a special election must be signed by at least ten (10) members of that chapter. Upon receipt of the petition, the Executive Committee of the chapter shall, within ten days, schedule a special election. A mail-in or electronic ballot will be distributed to the membership of the chapter along with an explanation, which must be provided by the petitioners, of why the individual should be removed from office. The person who is the object of the recall petition will be given equal space to reply to the petitioners' statement. A simple majority of those voting is required for removal. Section 2: In the event that the recall petition succeeds, the Executive Committee shall, at its sole discretion, either (1) choose a replacement from among those who were candidates in the previous election, or (2) allow the seat to remain empty until the next general election. Section 1: The General Assembly consists of all members of the chapter who are in good standing and vote on all matters that come before the body. The General Assembly has the responsibility to approve the chapter’s annual budget, levy dues, and establish policy. Section 2: The annual meeting of the General Assembly will take place between April 1st and the end of the semester. Additional meetings of the General Assembly of the chapter shall be called by the chapter’s Executive Committee when there are matters which must be brought before the entire membership. a) Special session meetings may be called by the President or by those members of the Executive Committee having the powers of the directors, or shall be called by the Clerk, or in case of death, absence, incapacity or refusal of the Clerk, by any other officer and including the signature of ten (10) unit members. The ten members must include at least 1 member of each constituency (pre-tenure tenure track, tenured, non-tenure track, librarian). b) The meeting request must be written and state the specific agenda item which the membership must act upon forthwith. The request must be received by the FSU no less than five working days prior to the proposed meeting date. Upon receipt, a date and meeting location will be set and a call to the meeting including the agenda item shall be distributed to all members. Section 3: A quorum for the purposes of conducting business shall consist of 20 FSU members in good standing present (inclusive of virtual) and voting on announced agenda items. Section 1: There will be a Grievance Committee which will be a standing committee of the chapter and will include grievance officers. Section 2: Members of the Grievance Committee shall be elected by the Executive Committee upon recommendation of the President. Term of membership on the Grievance Committee shall be two years with option for reappointment. Should a Grievance Committee member be unable to serve temporarily (such as being on sabbatical), this member can be temporarily replaced by a vote of the Executive Committee upon the recommendation of the President. Section 3: Grievance Committee meetings must be held at least once a semester and more often as necessary. The President should be kept informed of the filing of complaints and the progress of all grievances. The Grievance Committee shall also report to the Executive Committee, within the limits of confidentiality, the activities of the Grievance Committee. Section 4: The Grievance Committee is empowered to file grievances on its own authority, on major policy matters. The Grievance Committee shall report to the Executive Committee (and in summary fashion to the chapter membership) on the filing and disposition of grievances. Section 5: The Grievance Committee may file policy grievances on behalf of the bargaining unit as a whole after receiving authorization to do so from the Executive Committee. Section 6: The Grievance Committee may also, with the approval of the Executive Committee, recommend to the Joint Coordinating Committee (MSP/FSU) that individual grievances be pursued at higher levels external to the campus structures. Section 7: There will be an Elections Committee which will be a permanent committee of the chapter. It shall consist of members of the chapter solicited from the membership and appointed by the Executive Committee. Term of membership on the Elections Committee shall be two years with an option for reappointment. Section 8: The Elections Committee shall be responsible for soliciting nominations for all elective offices. The Committee shall then present the slate of candidates for a vote by members of the chapter. This vote shall be conducted by secret ballot according to principles established by the Elections Committee. Section 9: A bargaining team shall be established as the need arises. The President shall recommend, for approval of the Executive Committee, members to serve on the bargaining team to negotiate a successor Agreement or to negotiate agreements on any other subject of bargaining as agreed to by the FSU and the Administration. The bargaining team for the successor agreement shall consist of four to six members, and its membership shall be open to all members of the chapter. Bargaining teams empowered to negotiate any other agreements shall be populated according to need. Membership on these teams shall be open to all members of the chapter. Term of office shall cease upon execution of a new Agreement. Section 10: The President, in consultation with the Executive Committee, may establish temporary committees for the purpose of a specific activity or task. Such committees shall be subject to guidelines, inclusive of committee charge, composition of committee membership, term of membership, etc., established by the President, in consultation with the Executive Committee. Section 1: The 1999-2000 Executive Committee shall submit these bylaws for ratification to the entire membership of the Faculty Staff Union, Inc. A simple majority of those voting in the affirmative suffices for passage of these bylaws and all its provisions. Section 2: Amendments to these bylaws may be presented to the General Assembly at a properly called meeting upon recommendation of the Executive Committee or upon presentation of a petition signed by ten (10) percent of the membership. Ratification of amendments to the bylaws shall require the approval of two-thirds of those members present and voting at the General Assembly. If a majority of the executive committee so chooses, ratification will take place by mail or electronic ballot to the entire membership and approval will then require a simple majority of those voting. This is the only procedure for amending these by-laws. Section 3: Notice of proposed amendments shall be distributed to all members at least 10 calendar days before the meeting of the General Assembly. Unless otherwise provided for, all amendments shall become effective immediately upon ratification. Section 1: Meetings of the General Assembly and all committees of the Faculty Staff Union, Inc. will be governed by the latest edition of Roberts Rules of Order. Section 2: The fiscal year of the Faculty Staff Union, Inc. will extend from July 1 to June 30. Section 3: The Faculty Staff Union, Inc will transmit to the Massachusetts Teachers Association from membership dues that portion of the dues specified for the current year according to the timetable established by the MTA. Section 4: The Faculty Staff Union, Inc. subscribe to the NEA Standards for Local Affiliates (bylaw 8-7). Section 5: All authorized delegates and alternates to the MTA Annual Meeting and to the NEA Representative Assembly shall be nominated and elected in accordance with the bylaws of those organizations. Section 6: The principle of Affirmative Action shall be honored in all aspects of the Faculty Staff Union, Inc. organization and practice.